The Advanced Imaging Society (AIS) presented its top annual honors for technical achievement at the 6th Annual Technology and New Products Awards at Paramount Pictures Studios in Hollywood yesterday, and has recognised Prime Focus World (PFW) with a Lumiere™ award for its proprietary ‘DeepGen’ stereo technology. The Society’s Lumiere statuettes are presented to companies and products that have achieved both ‘innovation and impact’ in moving the entertainment industry forward. PFW’s ‘DeepGen’ technology, part of its ‘Hybrid Stereo Pipeline’, allows the use of ‘deep’ compositing data in the stereo conversion process, providing superior conversion results, a more efficient workflow and more flexibility and control. 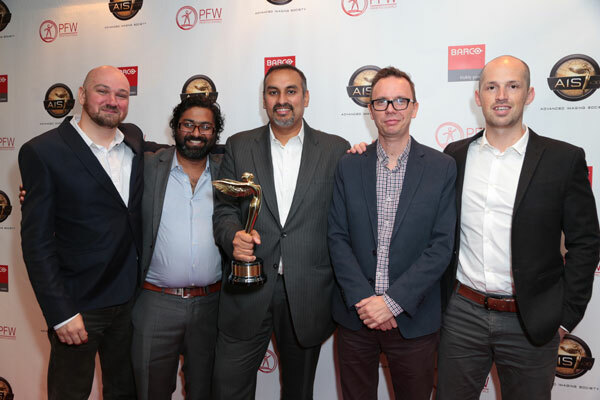 Accepting the award on behalf of the PFW technology team were Global Head of View-D™ Eoin Greenham and Software Developer Laszlo Rikker, who attended the awards along with Global Technical Supervisor Rajat Roy and Software Developer Luke Gray. PFW was honored at the ceremony alongside companies such as AMD, Barco, Jaunt, Nokia, Sony Computer Entertainment and Technicolor. For a full list of the event’s honorees, click here.